Why hello there! My company is hosting our annual conference downtown this weekend and I am excited to see all of our hard work and planning come together. I’ll be working late tonight and most of tomorrow afternoon, but it comes with its perks too. Like free food. Except no meat for this girl. I’m hoping for some shrimp. Shrimp and grits maybe? 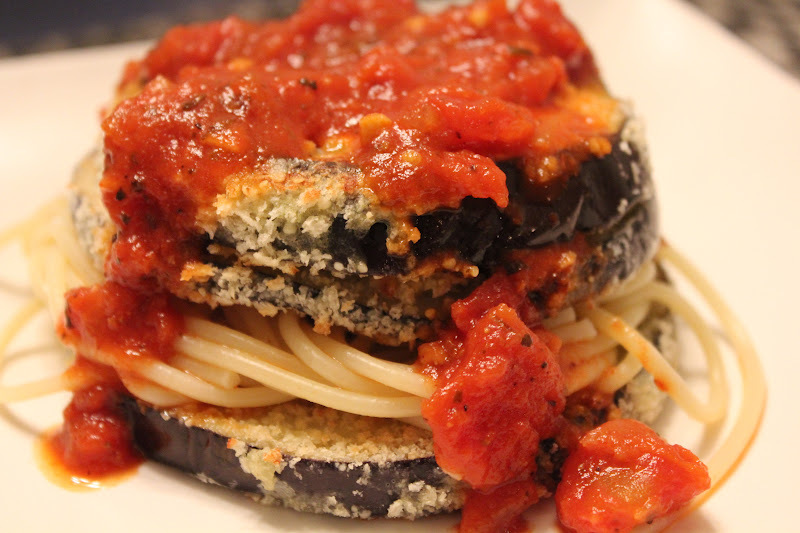 Or something reminiscent of this Stacked Parmesan Eggplant Marinara would be nice too. I knew Greg might would definitely have to be convinced to go for a meatless meal, made with eggplant of all things. The eggplant medallions were lightly dipped in a parmesan cheese and bread crumb mixture to bring the dish more to his level. Maybe Greg was just extra hungry that night, maybe he was just eating quickly to get it over with, or mayyybeeee he really liked it 🙂 Because he was almost done by the time I sat down with my plate. I think sticking with spaghetti noodles is best for this particular dish, and a good tomato-base sauce is key too. Serve the stack with roasted or steamed vegetables and I’ll bet you don’t miss the meat! 2. Combine parmesan cheese and breadcrumbs in a small bowl. Add flour to another small bowl and the egg to yet another small bowl. 3. Prepare eggplant medallions by dipping each to coat in flour first, then egg, then parmesan/breadcrumb mixture. 4. When grill is ready, add coated eggplant to the grill and cook until golden brown, about 5-6 minutes. Remove from grill and keep warm in 200 degree oven if necessary. Continue to cook eggplant on grill in batches until all have been cooked. 5. 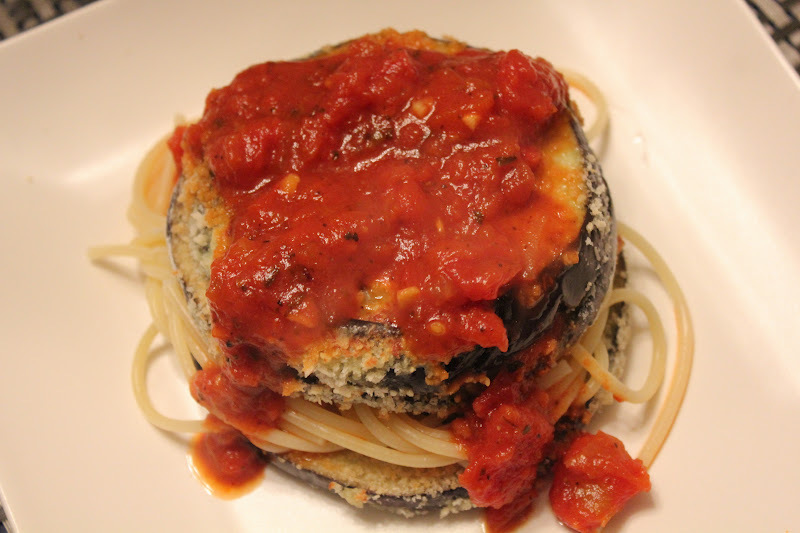 Add one eggplant medallion to plate. 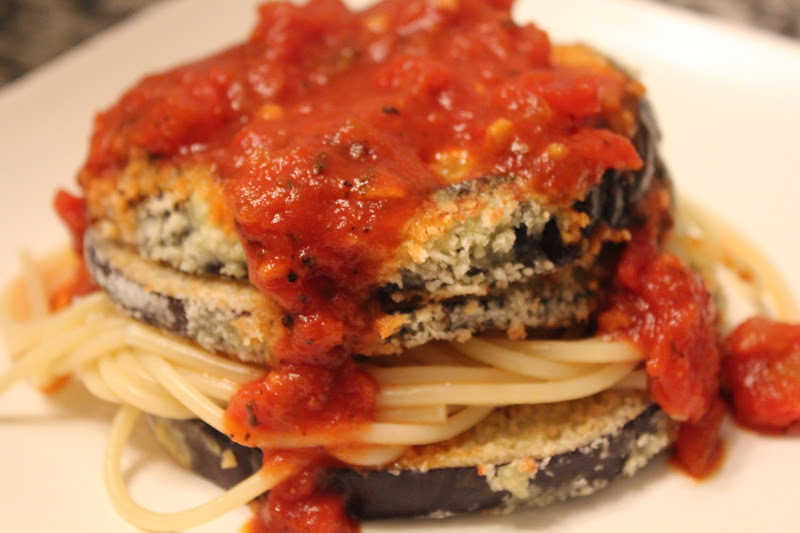 Top with spaghetti and another slice of eggplant. Continue to alternate layers as desired and top with heated marinara sauce. Serve immediately.